The Buyer Utility Map, developed by W. Chan Kim and Renée Mauborgne, helps to get managers thinking from a demand-side perspective. It outlines all the levers companies can pull to deliver exceptional utility to buyers as well as the various experiences buyers can have with a product or service. This mindset helps managers identify the full range of utility spaces that a product or service can potentially fill. 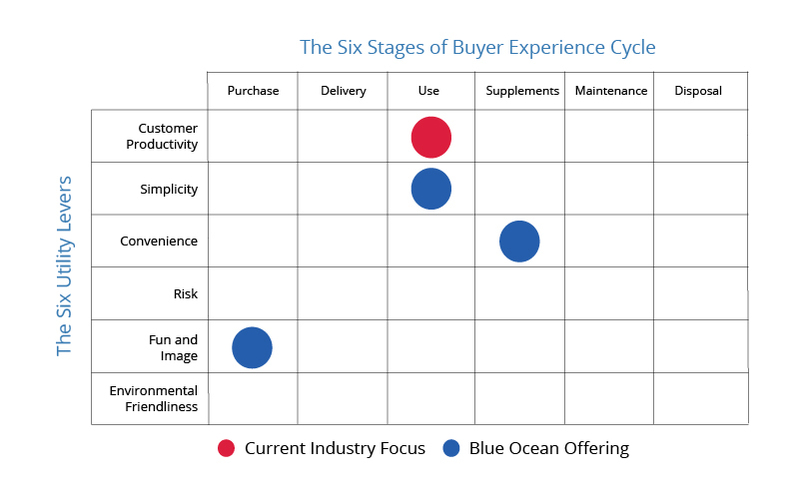 It has two dimensions: The Buyer Experience Cycle (BEC) and the Utility levers. By locating a new offering on one of the spaces of the buyer utility map, managers can clearly see how, and whether, the new idea creates a different utility proposition from existing offerings but also removes the biggest blocks to utility that stand in the way of converting noncustomers into customers. In our experience, managers all too often focus on delivering more of the same stage of the buyer’s experience. This approach may be reasonable in emerging industries, where there is plenty of room for improving a company’s utility proposition. But in many existing industries, this approach is unlikely to produce a market-shaping blue ocean strategy.